The postponement of the scheduled Cornish Pirates versus Hartpury RFC tie in the British & Irish Cup, once again brought to the forefront of one’s mind the subject of Mennaye mudfests witnessed over the years. 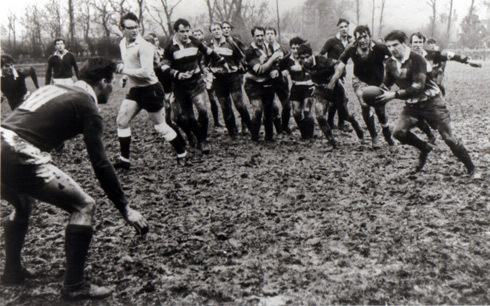 We have certainly witnessed our fair share of Mennaye Mudfests in the past, especially from the forties to the seventies, as with no adjacent ‘Nurseries’ field back then, the three Senior XVs and a Colts side did virtually all of their training and playing of matches on just the one pitch. By November each season the field became increasingly muddy, and by January it was a field of mud! Note the photograph taken in 1968, when the Pirates played Devonport Services. To add a little interest the Pirates by the way won, 6-0. Wing Stuart Michell and flanker John White scored a try each (a try was worth three points back then), and Pirates pictured l-r are: Alfie Fowler, Alvin Williams, Keith Stirling, ‘Stack’ Stevens, Mike Perkins, Chris Walsh, John Michell (with ball), John White, and Roger Pascoe. The referee is the late Victor Martin, a popular and much-respected official, who was a brother to David and John Martin. Having mentioned how muddy it was back then, in contrast, by Easter it was on occasions like playing in a dust bowl! Anyway, back to Mennaye mudfests, a number have also inevitably been experienced in recent years, all worthy to highlight. However, for this latest column we’ll look back to two such occasions, starting first with a game that proved truly memorable. Indeed, it stirred in my mind on Saturday morning before the Cornish Pirates game versus Hartpury RFC was postponed, as selected in the visiting side was one Luke Eves, whose dad Derek had played in the match about to be described. 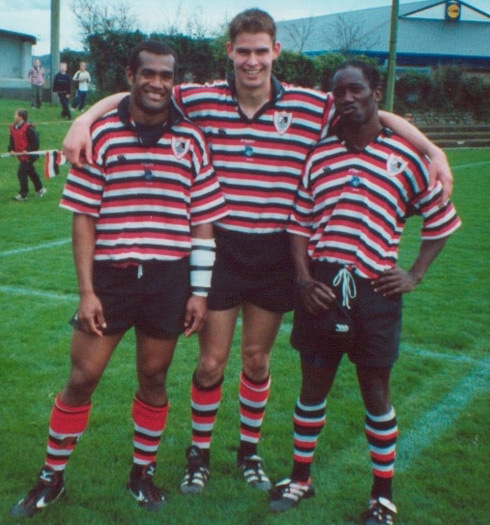 The game involving the Pirates was played against Plymouth Albion on the 18th December 1999, the occasion also remembered by ‘Paves’ (Alan Paver), who was back in those days playing for our cross-Tamar rivals. It was fourth versus fifth in Jewson National League 2 (South) – Redruth were third – as both sides strived to enter the fast approaching 21st century with the hope of achieving promotion. On the day, Peter Johnson’s Pirates had to battle against tough opposition, and even tougher conditions! I remember water running along the front of the stand literally like a river, and with a slippery pitch and a swirling wind it provided a real test. That the Pirates emerged 9-3 winners was terrific, and if ever one man had influence to encourage the team to victory it was flanker Derek Eves. On loan from Bristol at the time, the 33-year-old former England ‘A’ man was truly inspirational. Penzance & Newlyn (15-1): Nat Saumi (kicked 3 x penalties), Victor Olonga, David Sibson, Steve Evans, Rocky Newton, Andy Birkett, Mark Roderick, Chris Mills, Derek Eves, Jason Atkinson, Kevin Moseley (capt), Joe Bearman, John Thomas, Andrew Laity, Matt Kevern. Replacements: Wayne Jenkin, Kevin Penrose, Bryan Easson. Plymouth Albion (15-1): Chris Atkinson (1 x penalty), Steve Walkin, Russell Thompson, Richard Henwood, Gary Hooper, Tom Barlow, Paul Livingstone, Richard Durbin, Roger Thompson, Steve Dyer, Dan Ward-Smith, Philippe Farner, Wayne Reed, Graham Dawe (also Director of Rugby), Alan Paver. Replacements: Nick Adams, Jason Lockley, Lee Thomas. Nat Saumi, ‘Rocky’ Newton and Victor Olonga made a magic back three for the Pirates – and the ball boy on the left is Murray Westren! The second, more recent mudfest, was a game played by the Cornish Pirates against Nottingham on the 2nd December, 2012, when my match report displayed the heading ‘Pirates Win Mudfest At The Mennaye’. It was our penultimate home game in 2012, which we won 11-10 against the second-placed ‘Green & Whites’, who had a former ‘Pirate’, and someone hugely respected in Cornwall, namely Martin Haag, in charge. Martin had clearly settled well into his new job as their head coach, as a recent 63-7 points demolition of Bristol and a convincing 52-7 points win at home to Doncaster Knights had confirmed. It was Martin’s group of 'Merry Men' who dominated the opening exchanges, and they took a fourth minute lead thanks to a penalty kicked by fly-half James Arlidge. The Pirates looked to make an immediate response as centre Junior Fatialofa battered one hole through Nottingham's defence, and then, with support from his forwards, made a second dent. It was of no surprise that the thrusts soon forced the visitors to infringe and, with a penalty awarded, fly-half Kieran Hallett's successful strike made it 3-all. Rain and slippery conditions made handling difficult for both teams, so tight control was a sought after aim, and one that delivered a try for the Green & Whites in the fourteenth minute, when skipper/flanker Brent Wilson was driven over the line at the Newlyn gate corner. Arlidge added the two extra points. Nottingham's approach to this game was impressive, and with talismanic full-back Dave Jackson, who was making his 300th appearance for the club, soon forcing the Pirates to defend once more, another score looked likely. To their credit, however, the Pirates held the threat and then looked to up their game with No. 8 Laurie McGlone and skipper Gavin Cattle setting the example. Indeed, adding swashbuckling support one by one each already muddied forward seemingly handled the ball, and took play to within five metres of Nottingham's line. McGlone took off down the blind side, only to be held up at the scoreboard corner, however with effort maintained an unconverted try registered by flanker Phil Burgess made it 8-10 at half-time. Both teams emerged from the tunnel for the start of the second half wearing a change of shirts, as the crowd present also made light of the weather and quite rightly anticipated an enthralling second forty. On a day when it was always going to be difficult for the kickers, Hallett missed with one penalty effort and Arlidge was also then luckless with two attempts that came his way. When Nottingham were penalised for bringing man-of-the-match lock, David Lyons, down to ground at line-out time, the Pirates took immediate advantage to take play deep inside the visitors' '22'. Hopes were high that another score was ‘on’, and when Hallett had another chance at goal he struck what would prove to be the match-winning penalty. The Pirates now dominated proceedings, with flanker James Tyas, who hadsigned during the week on dual-registration with Bath Rugby, having a fine game on his debut. Hallett limped off near the end, which was a little worrying, and in fading light Nottingham strived hard to work their way up field at the end, but to no avail. Before the kick-off there was a minute's silence to the memory and in honour of a proud Life Member and Vice President of Penzance & Newlyn RFC, Dave Berryman, who had passed away on the Friday evening. On hearing the sad news squad members had reacted to quietly state that they were keen to win this one for 'Bez', and in doing so it was a truly admirable performance. The big man would have approved. In conclusion, rugby can be a funny old game, and often some of the great matches are played in ghastly conditions. This mudfest at the Mennaye was one of them and it took the Pirates up to sixth place in the league table. Cornish Pirates: W. Davies, B. Mercer, T. Riley, J. Fatialofa (S. Hill 70) T. Bedford, K. Hallett (JJ Kilmartin 75), G. Cattle (capt), L. McGlone, P. Burgess, J. Tyas (J. Buckle 64), G. Johnson (D. Barry), D. Lyons, A. Paver, R. Elloway, P. Andrew. Replacements (not used): P. Joyce, J. Yeandle, T. Kessell. Nottingham Rugby: D. Jackson, A. Lewington, T. Streather, J. Munro (A.Forsyth 66), R. Crane, J. Arlidge, A. Romans, A. Shaw (T. Calladine 59), B. Wilson (capt), R. Cooper (a present day ‘Pirate’), N. Rouse, D. Montagu, M. Holford, J. Duffey, M. Parr (R. Bower 59). Replacements (not used): S. Malton, J. Quinn, F. Barnham, A. Forsyth. To conclude, readers will hopefully have enjoyed this look back in time – as once again we now look for an improvement in the weather! While it was not a Pirates game I ventured down to the Mennaye to watch a Cup match between Mounts Bay and Coventry, now that was a mudfest and probably should not have been played but did because neither side wanted a postponement. Remember that one, SJP. There was a river running down the tunnel! Yes, it was muddy - and with the floodlights on from the start the Mennaye appeared as a lit up lake. 'Bay' missed Lee Jarvis and Richard Carroll in the EDF Energy tie played in January 2008, but their available side (present day 'Pirate' Paul Andrew was on the bench for them that day) performed very well, despite a 12-3 defeat. It was player-coach Brett Davey who piloted 'Cov' through the splash of a contest - the heavens having opened to produce the worst rugby playing conditions at the Mennaye for many a year (if any!). Other familiar names in Coventry's squad were those of Myles Dorrian, Laurie McGlone, Ian Nimmo, Carl Rimmer, Rudi Brits and Ollie Hodge - all of whom have worn our colours. I remember the day very well. Awfull gonditions the Promanade was closed for safety reasons. But that is Coventry rfc only victory in Penzance. But maybe we will get another chance at that fingers crossed. Love to see Cov back in the Championship. It would also be good to have Albion back. As the B and I cup is disappearing let's go back to a 14 team competition, and while we're at it, bring back playoffs.